Fourteen-year-old inventor Violet Baudelaire, her twelve-year-old bibliophile brother Klaus, and their three-year-old mordacious baby sister Sunny are orphaned after a mysterious fire destroys their home and kills their parents. 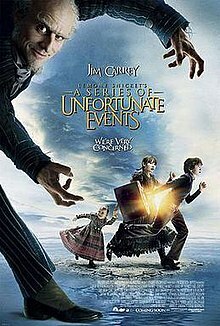 Mr. Poe, the family's banker, manages their affairs and leaves them in the care of their closest relative Count Olaf. Olaf is intent upon obtaining their family fortune, which will remain in the custody of the bank until Violet comes of age. He forces them to do chores and belittles them. ^ Joe Anderton (December 10, 2018). "Netflix drops trailer for A Series of Unfortunate Events season 3". Digital Spy. Retrieved December 14, 2018.